I purchased this lovely unrestored Daimler from an enthusiast in Maastricht. An exchange of emails and photographs was made before a price was agreed. The car was delivered to a UK port and I collected it with a large tow car and trailer. It was just as described and exactly what I wanted. Although originally registered EHP 500, DVLC would not accept the evidence I was able to provide and the car was re-registered 638 XUG. 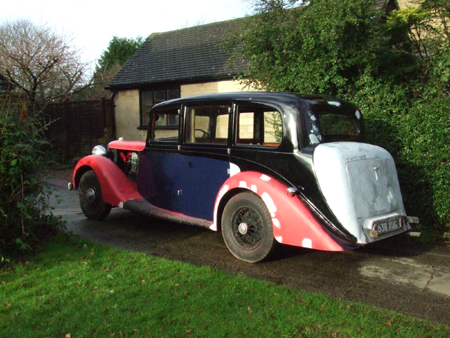 The original paintwork was unfortunately too far gone to save and was flaking off in places. I stripped the car to bare metal using paint stripper, tackling one panel at a time. 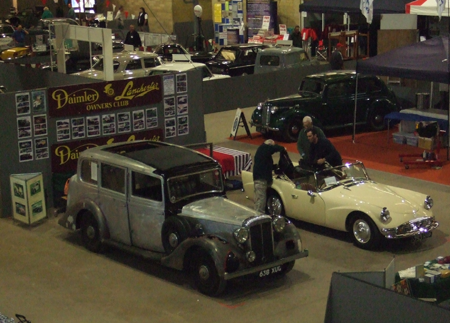 The 70 year old coachwork was in very good condition, requiring just a couple of weld repairs to the front wings. The aluminium panels were excellent, although there were many small dents, which required filling and flatting back. The steel sections were painted first with Jenolite, then high build corrosion resistant primer, the alloy was etch primed followed by high build primer. Several coats of synthetic coach paint were then applied, each coat was flatted back before the next was applied. On the larger panels, the paint was applied using a B&Q roller, the smaller sections were brush painted. The entire car was then flatted off and polished, the finished job was indistinguishable from a spray painted finish. The sunroof was leaking and had been ‘patch repaired’ in the distant past, the only option was to strip it out of the car and repair it properly, with new drain channels and leathercloth. This was a huge job, there being over 100 hidden pins holding the surrounding wooden trim and alloy channel in place. The interior was completely original, including the headlining, which despite the leaking sunroof was in remarkably good condition. The fabric trimmed rear lounge responded very well to a good clean, unfortunately the rear carpet had been discarded before I owned the car, I cut and bound by hand a new piece, the front carpets were well worn, these I retained but cut and bound a cover mat. The wooden trim was dirty with flaking varnish, I stripped this and varnished using exterior grade high gloss, this was then flatted back using T-Cut, this gives a nice even satin lustre which is close to the original finish. 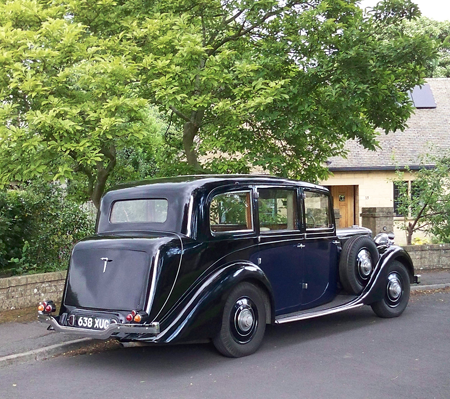 The EL24 is a large car (although described in Daimler sales literature as a ‘light limousine’), with a 10’4″ wheelbase and a huge body, surprisingly the Daimler was most pleasant to drive and was of course extremely comfortable. 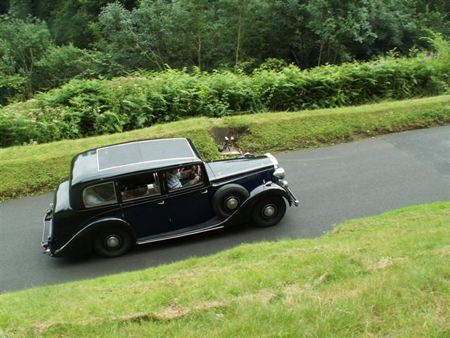 Performance for such a large car was impressive, the hillclimbing ability was particularly good, as was demonstrated at Shelsley Walsh during the Daimler SP250 ‘Dart’ 50th anniversary celebrations, when the car romped up the hill. 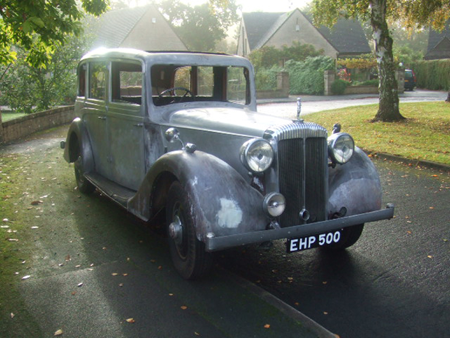 I travelled thousands of miles in this excellent motor car, often with no rear seat passengers! It never let me down and always created an impression, whether being driven to the supermarket, Shelsley Walsh or to the National Exhibition Centre where it was displayed on the DLOC stand at the Classic Car Show. 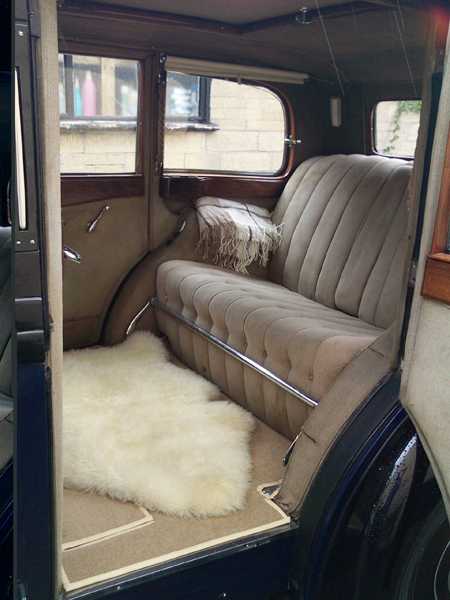 Family picnics were a delight in this stylish limousine, the rear compartment was a lovely place to be, with its fold down picnic tables, occasional seats, chromium footrest, rear and side window blinds, cigar lighter, rope grab handles and electric division. The sunroof was huge, with the windows down and roof open, it was almost like an open car, what more could you want from a motor car? 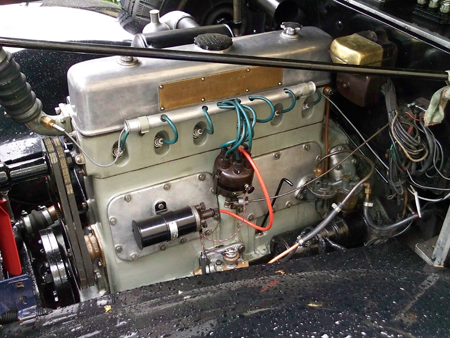 Mechanically the car was excellent, although it did suffer from several sticking valves and a small crack in the cylinder head, which was professionally welded. All the repairs and renovations other than this were carried out at home. 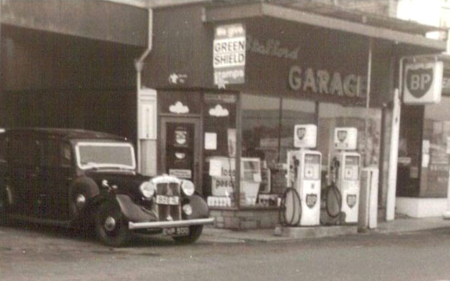 The 3,317cc, six cylinder engine was silky smooth and powerful, the pre-selector transmission easy to use, with well spaced gears and with the lovely hum in neutral, that only the pre-war Daimlers have. 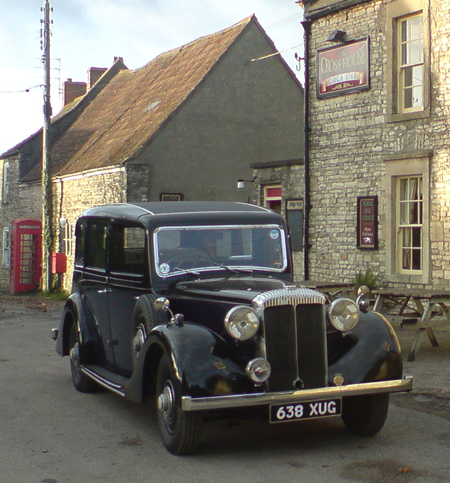 The rod operated, servo assisted brakes were very good and made driving this car a real pleasure. I found the ideal cruising speed was around 50 mph, but on several occasions on motorway journeys, I found the speedo’ creeping up to 70 mph, a reduction in speed was made in deference to the cars age, but I have the feeling it would have been quite happy to tour at this high speed. 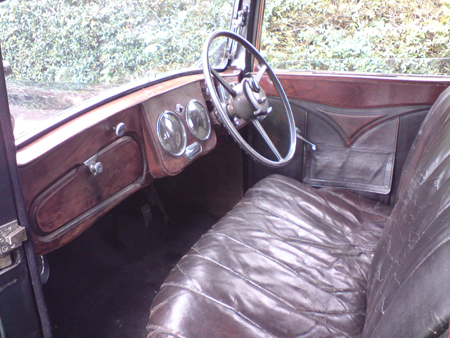 The EL24 was available with Daimler’s own bodies, or as a chassis for bespoke or catalogued coachwork. The forward mounted engine allowed for a larger body than other chassis of similar length, Daimler also claimed that it improved roadholding, I can only add that for a car of its size, it certainly did handle well. 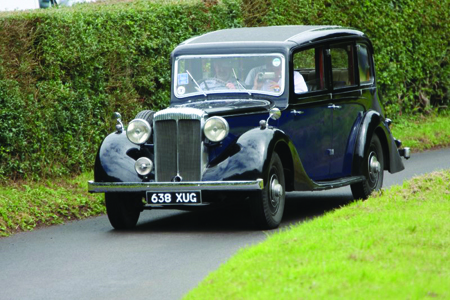 These are most underrated motor cars and fetch a fraction of the price of a similar Rolls or Bentley, I would thoroughly recommend this model if you are looking for a wedding car or a pre-war people carrier for family days out, I will certainly have another EL24, a nice open tourer would suit! If you would like to know more about the Daimler EL24, or have one for sale please contact me by submitting the form below.